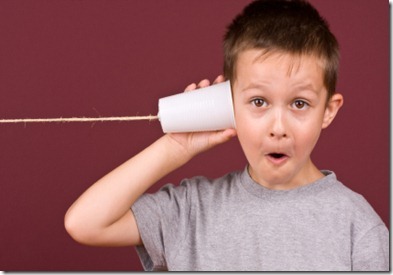 I am constantly learning and discovering things in my quest for better communication with my kids. Recently I shared some tips for engaging children in conversations – see Eight Tips for Effectively Communicating With Your Kids. But, before you can have a good conversation with your kids, you have to get a line through to them. You have to get their attention. And sometimes this can be a difficult challenge. There are so many things that gain the focus of our children – including television, video games and even things that we generally encourage like books and their imaginary world of play. I am all for learning the discipline of focusing on a task at hand; but, when our children are in the middle of these things, it can be almost impossible to engage them in any sort of meaningful conversation. Ask. One of the first things we should do is ask for the child’s attention, “May I have your attention please,” or “May I have a moment with you.” This shows respect for your child (which builds respect for you) and sets an example for how you want others to get your attention. Whisper. Our children are often accustomed to loud noises and loud talking. Using a quiet voice (a whisper, hushed tone, etc.) can cause enough intrigue to gain their attention. Surprise. Something that will make a child jump like a clap of the hands, whistle, or other moderately loud, sharp sound. A surprising sound will break the attention from one thing and focus it on you. Order. Use a sharp, yet not unfriendly, raised tone to indicate the importance of shifting their attention to you. Pick Them Up. If they are little, pick them up. If they aren’t so little, this could be difficult; so, try sitting next to them and holding them or putting your arm around them. This is a great way to share some love while changing their object of focus. Something Silly. Make a funny noise or funny gesture. Be careful not to take this too far; but, this can often times bring the attention to you in a light-hearted way that creates an opportunity for a pleasant conversation. Something Different. With a similar thought process as Something Silly, this is doing something that is not expected – something different than what is normally expected from you. Touch. Make physical contact in order to let your child know that you require their attention. A simple hand on the shoulder, maybe a quick hug. Intrude. Invade their space. Interrupt the moment enough so that they must acknowledge your presence and reason for being there. Line of Site. Sometimes we need to be a bit more direct. Try stepping into their line of site so that they have to look at you. Remove the Object. If the object keeping their attention is small and portable, remove the object and the temptation to continue focusing on that object instead of you. Change Locations. Invite your child to change locations with you. This may be as simple as moving to a different room in the house; or, it could be taking a walk outside. By the way, I have also tried shouting and being angry in order to get attention (especially after so many other attempts have been ignored). This is a very easy, and even natural-feeling, response. However, it is a response that usually does not have the lasting affects that we truly desire. An angry episode generally destroys ‘the moment’. And, much to our dislike, shouting to get attention sets an example that our children will be quick to imitate. If this happens to you, take a moment for a grown-up time-out. What is your favorite way to get the attention of your child? You can leave a comment below? It’s kind of amusing to think about all the things we will do when trying to get a child to focus on us. I do take my kids to a different room in the house a lot – sometimes so that the child in question will not be distracted by other people or things; and, sometimes so that my other children do not encroach the conversation. Sandra and Meryl, I was so sorry to hear of Ca2&8rineh#et17;s passing. Didn’t find out till Saturday and have been working all weekend. Please know Kathy and I are praying for your families. Good stuff! I too, have used anger and it doesn’t ever get the response I desire. With your dog…that is awesome! If you stop to think about it, there really are a lot of similarities in training dogs and training children.